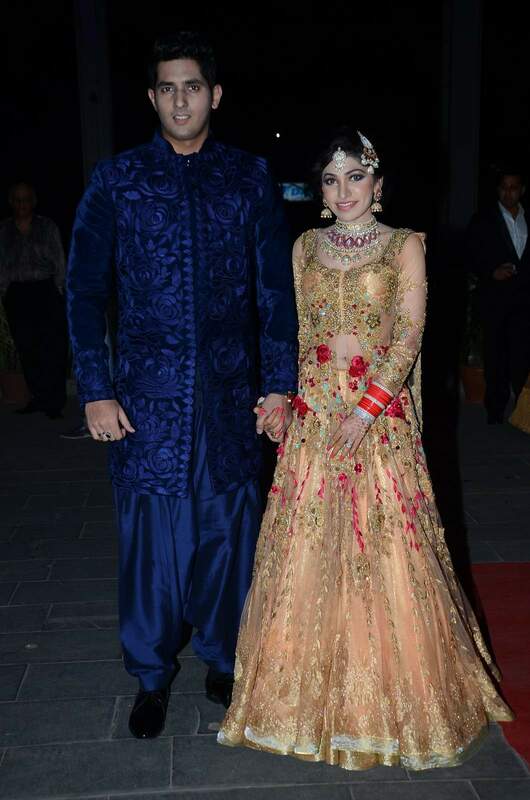 T-series chairmen Bhusan Kumars sister Tulsi Kumar tied the knot to Hitesh Rahlan last month.If you dont know already Tulsi Kumar is a bollywood playback singer and her wedding reception was a star studded lavish affair attended by a huge number of bollywood stars and so here is the mandatory who wore what. The Bride Tulsi wore a champagne gold lehenga with embellishments and floral detailing. I love the colour and the Chura goes very well with the lehenga, but i feel the jhoomar should have been skipped. But ofcourse she is the bride and going over the top is always excused. The Groom wore a blue floral detailed kurta which was a nice contrast to the bride. 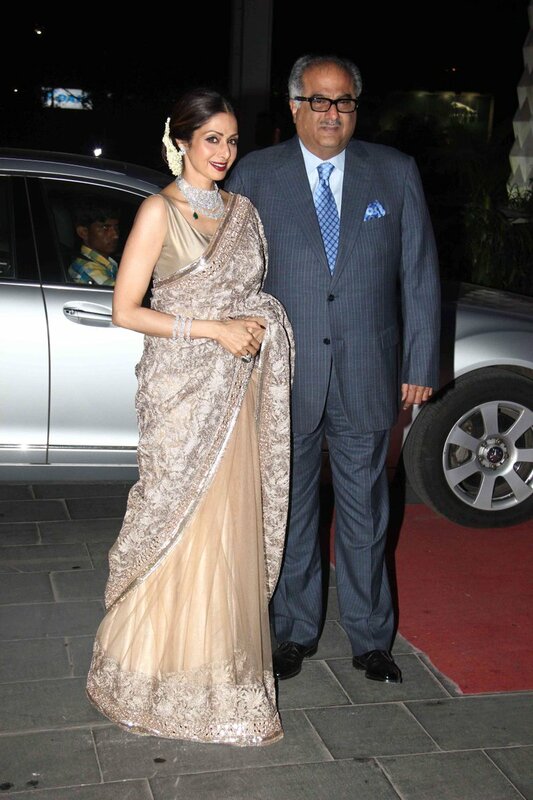 Divya Khosla Kumar the sister in law of the bride wore a gown in silver which took tackyness to new levels. The cut outs at the waist was a deal breaker and it was so inappropriate for a wedding. Sonakshi Sinha wore a blue Anita Dongre lehenga draping the dupatta in half sari style. Love the colour on her and the hair though good i wish she gives us a short hair with ethnic wear look soon. Ameesha Patel wore a blue manish malhotra lehenga . The lehenga had yellow patchwork which could work well for ameesha only if her make up was a little less tacky! A dupatta is badly missed here. Like her bangles though . 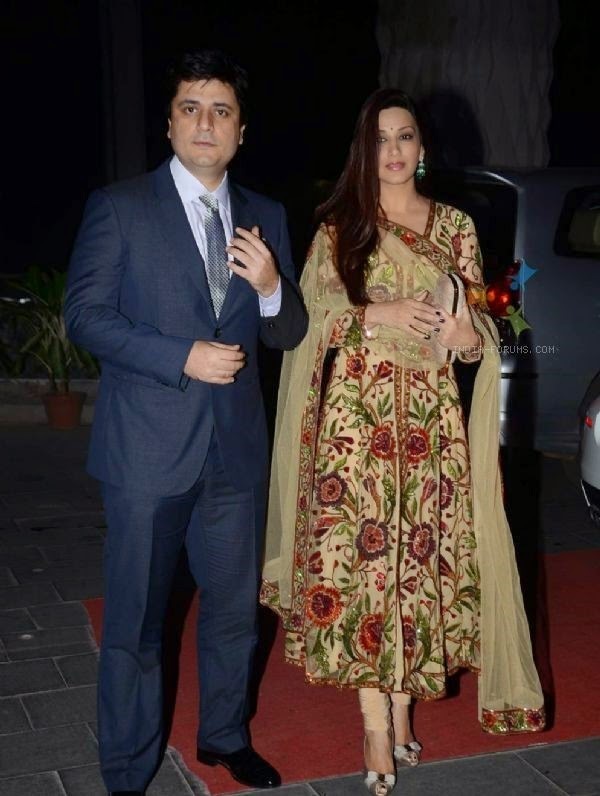 Sonali Bendre came across as a fresh breathe in a floral embroidered suit which she paired with Mc queen clutch . Love her simple look but wish she has not chosen a bow shoes. Jaqueline Feranandes opeted for a white and royal blue Arpita Mehta lehenga. I love her look, looks so breezy and event appropriate. Extra love for her jhumkas.. they go into my lust list. Suuny leone wore a peach leheng which was a good choice showing off curves nicely. Who do you looked the best at this wedding? I dont know about the best but the award for worst clearly goes to Divya khosla!